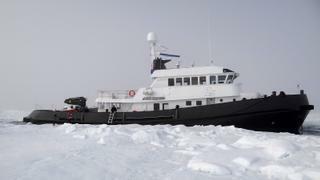 The 36.4 metre ice-classed explorer yacht Lars has been sold in-house at Fraser with Maarten Ten Holter representing the seller and Jan Jaap Minnema introducing the buyer. Originally built in steel and aluminium as an all-weather sea-going tug by Dutch yard Damen with delivery in 1995, Lars was converted into a luxurious superyacht in 2012 with a design by Felix Buytendijk and was further refitted by Balk Shipyard in 2016. Today, Lars offers a pleasant environment for up to eight guests. The owner’s suite is amidships on the lower deck and makes the most of the eight metre beam to include a bath and a large shower. Two of the guest cabins are of similar size, both twins convertible to queen-sized doubles if preferred. A further cabin can be used for either crew or guests. Guests are likely to favour the bridge deck which offers magnificent views as a result of the very large windows and has comfortable seating and a welcoming bar. The expansive bridge aft deck is ideal for al fresco dining should Lars head to warmer areas, with a built-in freezer and seating arrangement available. 57,000 litre fuel tanks and a single 1,500hp Caterpillar diesel engine combine to give her a range of 6,000 nautical miles when cruising at nine knots. Lars was asking €9,800,000 with VAT paid.